Out on the bike I primarily use a Fly12 camera and bike-light-combo for commuting, as it covers my needs as cycle camera, and I would think has been taking up market share from the casual and safety conscious cyclists. Sometimes though the Cycliq Fly12 isn’t the easiest unit to use and Shimano are hoping to bring in more users with a couple of fancy features, not least of which is an auto start/stop function, based on the transmission of data from your sensors. Which sounds like a great fire and forget function! But how does the Shimano CM-2000 far in real-world usage? Let’s take a look! We have the Shimano CM-2000, shocking I know, a rubber lens cap – which is actually a nice addition, micro USB charging cable, lanyard, battery, helmet mount adhesive tape, helmet strap, GoPro mount and cradle and some dead tree manuals!! But one thing which is NOT included in the box, which was seen in press shots is a muffle for the microphone. The door is then closed and additionally locked to prevent accidental openings. The Shimano CM-2000 as a removable front lens protector, which minimises the chance of having a damaged camera, without the need for a bulky external case. Something I’m very pro! On the underside are the rails for attaching to the plastic mount, and the wireless certification logos. The rails and mounting system are one of my favourite parts of the Shimano CM-2000. Yes, a metal, direct GoPro mount might be stronger, but having a little cradle, which attaches to a GoPro mount is just SO MUCH easier to live with when it comes to taking the unit out and charging it! The unit has a relatively small, and moderately unhelpful LCD screen on the back, above the power/stop button on the LEFT, and record button on the RIGHT. Still, shots can also be taken when recording by pressing the record button… but that button is so small, and most action cams are normally slung under the handlebars such that this is a useless function. A recording is initiated by pressing the record button until you get a long beep. Conversely, the stop button will give a short beep to registered the effect, and well stop recording. You can lock the keys on the Shimano CM-2000 by holding the Stop, Record and Mode buttons for 4 seconds. Although I’m not sure how often this will be of use. 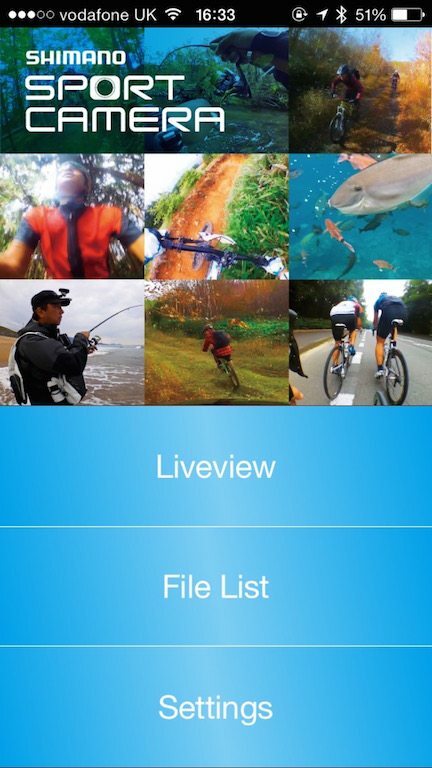 To really get the most out of the Shimano CM-2000 you need to download the Shimano camera app. You connect to the app by switching the Shimano CM-2000 into WiFi mode – which is a little fiddly. First off pressing the Mode button until “C” shows on the LCD to put the unit into connect mode. You then need to hit the scroll key to bring up the WiFI icon. 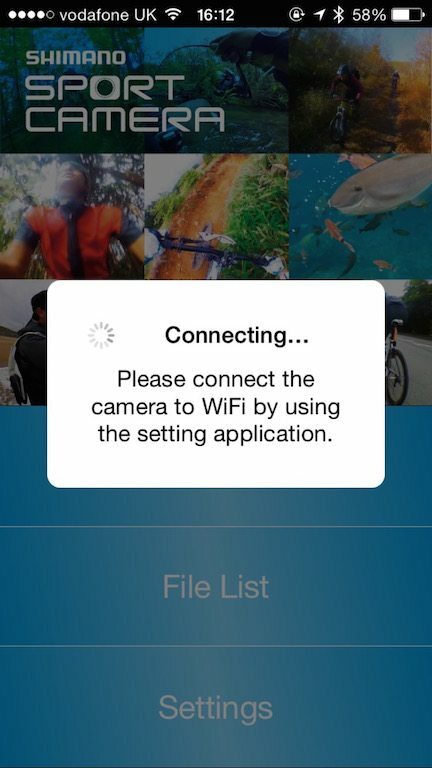 With the above steps followed, the Shimano CM-2000 sets up a WiFi network to which you can connect to on your phone. The password to which is set as “shimano_cam”. From there the app allows access to all of the camera controls, including a LiveView function, which enables you to view and frame your images. In the bottom RIGHT of the LiveView image is a series of buttons to allow you to change the camera angles for the best picture. From the app, you can also connect your various sensors. Which although the unit does support BLE, you can only connect to ANT+ sensors. But in addition to this, as the Shimano CM-2000 has Bluetooth, allowing it to receive data from your phones, GPS, which in turn can be used to start and stop recording based on movement. But the question with all action camera’s is what is the quality of the recording like? I really surprised how much Shimano has been able to improve the Cm-2000 compared to it’s older unit. As a cycling camera, I’d put the Shimano CM-2000 as 4/5, especially with the ease of removal from the bike, which is very important if you are locking up your bike in town. The overall unit compared to something like the Garmin Virb Ultra should be 3/5, but given that I have seen places selling this unit for £64, I can only say that is an utter STEAL and for that price an easy 5/5. Frankly, I think thw price has a lot to do with the rating on the Shimano CM-2000, if you can find the unit for under £200, then it is still definately 5* worthy! As ever, any comments, drop them below!